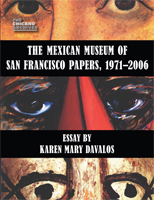 The Mexican Museum of San Francisco Papers, 1971–2006, is the first historical account of the institution, which is the oldest museum in the United States that focuses on Mexican and Mexican American art. Karen Mary Davalos draws on the CSRC’s collection of administrative documents to trace the museum’s growth from the early 1970s, when planning began, to 2006, when the museum closed its exhibition space in Fort Mason. Dr. Davalos explores the influences that guided the museum’s development—the vision of its founder, the desires of curators and patrons, the energy of the Chicano movement—and analyzes its influential exhibition program and nationally recognized education program. In a separate section she offers a series of topics for further research. The volume concludes with a guide to the collection and a selected bibliography. 13 black and white illustrations.